The XIXth International Symposium on Retinal Degeneration (RD20/20) will be held in the beautiful town of Mendoza Argentina. As in past meetings, the program will focus on age-related macular degeneration and inherited retinal degenerations with several keynote lectures, three full days of oral presentations, three evening poster sessions, a full day excursion and a gala dinner to round off the meeting in a social setting. We are actively raising money to support travel awards for competitive students, postdocs, and young faculty. We hope to be able to fully support attendance of up to 50 awardees, which will be chosen according to their submitted scientific abstracts by a dedicated Travel Awards committee. Women and underrepresented minorities are encouraged to apply for Travel Awards and to attend the meeting. 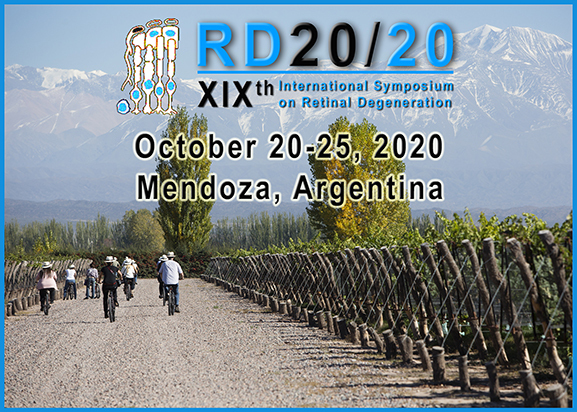 We are excited about the RD220/20 meeting and very much look forward to welcoming you in Mendoza.